Difference Between A VPN And Proxy? Whenever we wish to hide our identity over Internet or wish to access a restricted or inaccessible web content, two solutions instantly strike our mind, a VPN and Proxy Server. It is often suggested by people to use proxy or use a VPN to surf the Internet like an anonymous. But few people know that both VPN and proxy are not the same thing, even though their functionality are roughly similar. 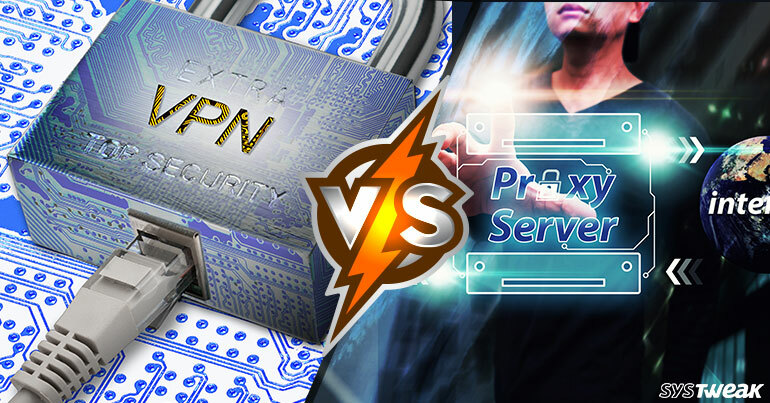 In this blog, we intend to bring forward the differences and similarities between VPN and proxy. VPN, which stands for Virtual Private Network, helps in a creating an encrypted channel by routing all the traffic of your system through a virtual private network server. This means a VPN allows all the traffic coming from your PC with some other IP address and hides your current IP. Now, whatever activity you perform over Internet, i.e. surfing a website or checking your social media account can’t be tracked by anyone. Only the VPN server which you are using can track and make a log of all your activities performed over Internet. To cut a long a long story short a VPN just acts as a firewall to give you a security over the web. Must Read: Do VPN Apps in Android Really Work? A proxy or specifically a proxy server is an intermediate that is placed between your computer and the remote server i.e. Internet. Like VPN a proxy too provides you anonymity by hiding your IP address. In other words, whenever you use a proxy server to surf over Internet you can access the sites which are restricted or unavailable in your region. This means if you are in a region where YouTube or some other social media is blocked then proxy can help you out. How Proxy Is Different From VPN? On the outlook, the two seem very similar, however there are differences between the two and in fact, the above mentioned is the only similarity between VPN and proxy. VPNs are deployed at the most basic level i.e. at the operating system level. While proxy can just be used on single application basis like you can just set the proxy for the browser you are using or the bit torrent client. This mean that once you configure a VPN server for your system then all the traffic from any of the applications installed on the system will be proxied. Another difference between a VPN and proxy is the encryption level. The encryption protocols used by VPN makes it more reliable and secured when compared to a proxy. If you are using a VPN, then even your ISP can’t keep a track of your activities which is not possible in case of proxy. To sum up, one can understand that if you just want to access some websites over Internet that are inaccessible on your geographical region then you can use proxy. However, if your intention is to keep all your activities anonymous so that no one can snoop around (not even your Internet service provider) then go for VPN.